Will Buster Martin (102) Compete in Sydney Games? Is he really a centenarian, or *only* 94? Will Britain's "Oldest Marathoner", Pierre Jean "Buster" Martin, who claims he will be 103 years old on September 1, compete against Australian centenarian Ruth Frith in the 2009 World Masters Games, to be held in Sydney from October 10 to 18? Ruth, a Brisbane great-grandmother who'll celebrate her 100th birthday on August 23, hopes someone will compete against her in the Games' first-ever "100 and over" class. "You know how it is," she says. "You want to try to compete with those younger folk in their 90s." She has registered for the hammer, discus, javelin and shot events. The Sydney 2009 Masters Games will be the world's largest multi-sport event, with up to three times as many competitors as the Olympic Games. About 25,000 competitors from more than 100 countries will take part in 28 sports at more than 70 venues. Anyone can take part in the WMG if they meet the minimum age requirement for their particular sport. The Games are where ordinary people, from former champions to recreational sport rookies, can have extraordinary experiences, with grades catering for competitive, recreational and social players. The Games encourage people from all walks of life to become involved in physical activity by participating in sport. But there's a fly in the ointment. Buster Martin cannot -- or will not -- produce evidence of his age, so he may not be eligible for Sydney 2009. Many Brits think he's a younger publicity-seeking hoaxer. Skeptics say many of his stories are just too good to be true. 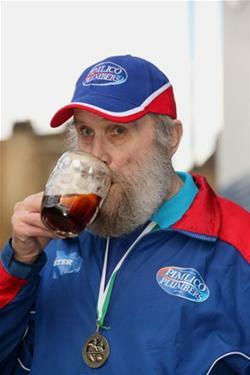 Employed three days a week as a van cleaner for Pimlico Plumbers, a publicity-conscious company in southeast London, he claims to be Britain's oldest worker, who refused to take a day off on September 1, 2006, which he claimed was his 100th birthday. As a Marathoner, Buster's a walker rather than a runner, but even that is a great achievement for an old man, whatever his age may be. The London media reported that he took a minute less than 10 hours to complete the 26-mile course of the 2008 London Marathon. The official timekeepers had gone home hours before he stumbled over the finish line. With " Buster" Martin's straggly beard, dry wit, and advanced years, his attempt to run the London Marathon was always going to present the PR people with an irresistable feel-good tale. At 101 years old, he would be the oldest man to complete the 26-mile course. But as he hobbled his way through the London drizzle yesterday, his story was beginning to unravel. On Saturday The Times disclosed that Guinness World Records had refused to verify his claim to be the oldest marathon runner. Now it has emerged why the record guardians will not be featuring Mr Martin in its celebrated publication. Internal correspondence between senior officials at the organisation, obtained by The Times, shows that Guinness has evidence that Mr Martin is a mere spring chicken of just 94. Guinness received information that Mr Martin, whose real name is Jean Pierre Martin, told NHS [National Health Service] staff that he was born on September 12, 1913, not 1906, as he now claims. A senior adviser to the world record company warned Guinness officials that Mr Martin " appears to be a fake, and more so, one being exploited by his company, which is using him to promote their services." His life, as he tells it, is extraordinary. He was born Pierre Jean Martin " up in the hills" of the Basque Country. " I don't speak French because I don't like them," he says. He claims his mother fell pregnant to a member of the affluent family she served, and mother and baby were smuggled to Britain to avoid the disgrace. His mother was put in a convent and baby Buster placed in an orphanage near Bodmin, Cornwall. After coming to London, Buster worked, joined the army and got married in France (hence no marriage certificate). " How did I get to France to get married? No passport. I learned how to get there and avoid the authorities, and I could still go and do it now if I wanted to," he boasts. Can he explain how? " No, because otherwise they would be watching the route for Christ's sake! Jesus, Mary and Joseph, what's the matter with you?!" Buster lurches forwards with a stare. " You won't get secrets out of me," he growls. Buster says he married a girl named Iriana in 1920. She was 13, and he was 14. They had 17 children -" twins, triplets, singletons, all sorts" - born between 1921 and 1934, including triplets Georgina, Georgia and Giselle. The article says " A confessed 'rogue' who drinks ale with a slice of orange and smokes like a chimney, Buster married Iriana, a girl from Tonbridge, Kent, aged 14 and fought in the Second World War in the Grenadier Guards. He switched to the Royal Navy and had a 35-year Service career but remained in London." Buster accepts countless invitations to take part in fun runs and to appear at other functions, devoting the proceeds to his favourite charity, the The Rhys Daniels Trust, (http://original.justgiving.com/bustermartin1/) which provides "Home from Home" style accommodation close to specialist children's hospitals throughout the UK. But what of Australia's centenarian Ruth Frith? She's the mother of Helen Searle (68) who won a bronze medal in the high jump at the 1958 Cardiff Commonwealth Games and silver medals in the high jump and long jump at the 1962 Perth Commonwealth Games. Ruth holds five World Masters Games records in the women's 95-99 age category .
" I hold five world records but, let's be honest, I'm the only competitor in my age group," she says with a smile. " I'm the oldest competing in the world. You have to aim high ... I look at what those in their 80s are throwing and try to beat them.
" Honestly, I don't know what is so magical about being 99. It's just two numbers on a piece of paper and I'm still the same freckle-faced redhead I was at 98." She is talking about the interest that has grown among a curious media over the past 12 months...Calls have come from Germany and photos have been taken by a French news agency. Phil, who was born in Lithuania and lived mostly in South Africa, often visited relatives in Sydney. When he turned 100, he became the fastest centenarian ever to run in a 100 metres sprint. He covered the distance in 30.86 seconds. Then, every year until he reached 104, he took part in the first few kilometres of the Philip Rabinowitz Memorial Marathon in Capetown (http://www.dailymail.co.uk/news/article-520589/Meet-worlds-oldest-sprinter-runs-100-metre-dash-age-104.html) He died on February 28, 2008.